What was the greatest goal of all time? Why do the Hungarians have a more philosophical sense of defeat than the Mexicans? Do the dead play football? In essays ranging from incisive and irreverent portraits of Maradona, Messi, Ronaldo, Pelé, Zidane, and many more giants of the game to entertaining explorations of left-footedness and the number 10, Juan Villoro dissects the pleasure and pain of football fandom. 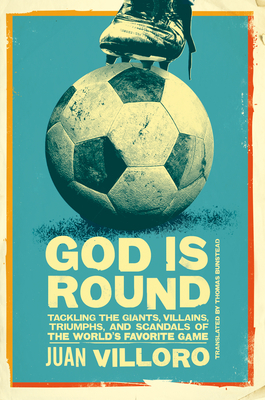 God Is Round is a book for both fanatics and neophytes who long to feel the delirium of the faithful. Juan Villoro is Mexico’s most prolific, prize-winning author, playwright, journalist, and screenwriter. His books have been translated into multiple languages; he has received the Herralde Award in Spain for his novel El testigo, the Antonin Artaud award in France for Los culpables. His novel, Arrecife, was recently short-listed for the Rezzori Prize in Italy. Villoro lives in Mexico City and is a visiting lecturer at Yale and Princeton universities. Thomas Bunstead's translations from the Spanish include work by Eduardo Halfon and Yuri Herrera, Aixa de la Cruz's story “True Milk” in Best of European Fiction, and the forthcoming A Brief History of Portable Literature by Enrique Vila-Matas (a co-translation with Anne McLean). A guest editor of a Words Without Borders feature on Mexico (March 2015), Thomas has also published his own writing in the Times Literary Supplement, The Independent, the Paris Review blog, 3ammagazine, Days of Roses, readysteadybook, and >kill author.